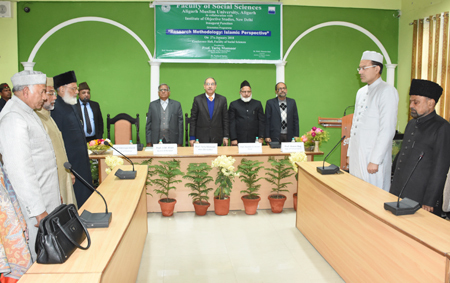 The faculty of Social Sciences, AMU, Aligarh in collaboration with Institute of Objective Studies, New Delhi, is organising an Orientation programme on “Research Methodology: Islamic Perspective”, in the Conference hall of the faculty of social sciences. 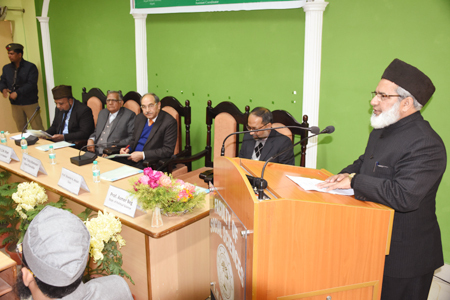 Its inaugural function was held on 27 January, 2018 at 2 pm where the vice-chancellor of Aligarh Muslim University, Prof. Tariq Mansoor, presided. 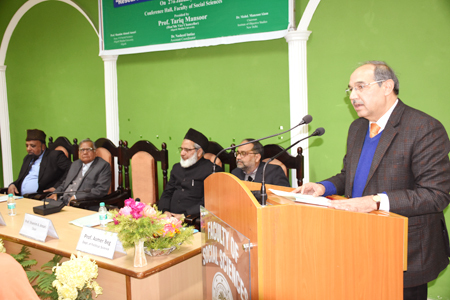 Prof. Shamim Ahmad Ansari, dean faculty of social sciences, in his welcome address welcomed the vice-chancellor. 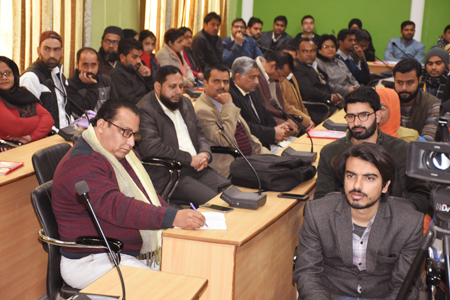 The two representatives of IOS, Prof. Z. M. Khan and Prof. Ishtiyaque Danish, who were on the dais and other senior faculties of the university, research scholars and post doctoral fellows were in the audience. 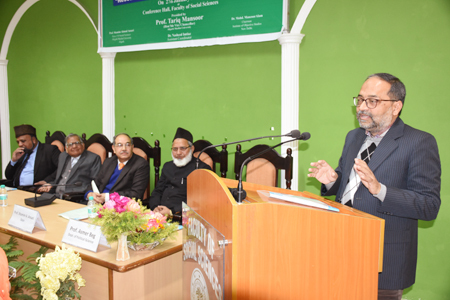 Prof. Ansari stressed the fact that there were various techniques and strategies evident from the Quran and Hadith for bringing about change in human perception, attitude, behaviour and coping with stresses which have been the burning problems of the day. He mentioned various examples in defence of his assertions. He emphasised that the mechanism and approaches emphasised in the Quran and Hadith are not limited to psychology, but are also applicable in all fields of life. 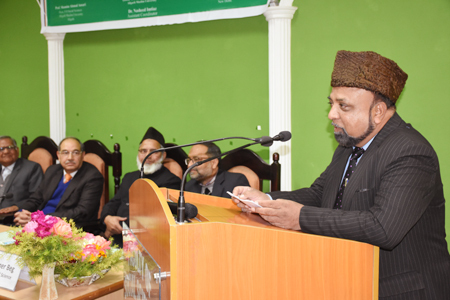 Prof. Ishtiyaque Danish, former professor of Islamic Studies and presently associated to the IOS as finance secretary, in his speech deliberated on the various aspects of globalisation, multiculturalism and promotion of knowledge in Islamic perspective. He asserted that it was necessary for every man and woman to acquire knowledge as ordained by Prophet Mohammad (PBUH). He also explained the research methodology utilised by the early Islamic scholars to carefully collect knowledge, verify the facts and scrutinise them while rejecting the false findings and notions. 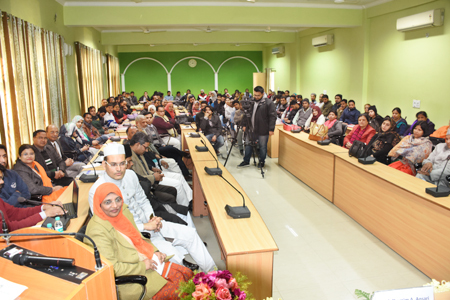 He also mentioned various practices of scholars from different fields such as social sciences, geography, health and medicine, philosophy etc., who practice research in Islamic perspective. He claimed that the participants would be definitely benefitted from the research methodology programme. 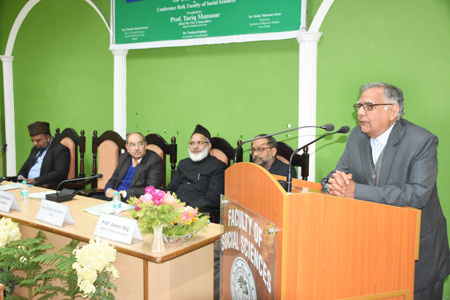 Prof. Z. M. Khan, Secretary General, Institute of Objective Studies, briefed the audience about the working of IOS, and its successful completion of 30 years. IOS has over 350 publications in various languages like Hindi, English, Urdu and Arabic, and these have also been translated into various regional languages for wider public understanding and knowledge. The vice-chancellor in his presidential remarks applauded the deliberations and emphasised the importance of Islamic perspective in research. He mentioned that humility should always be the mark of a research scholar towards not only his mentor, but everyone. He encouraged the young participants to work not only to add credentials to their name but to prove the benefits of research to society. He congratulated Prof. Shamim Ahmed Ansari, co-ordinator of the programme, for organising such a wonderful initiative. The programme concluded with the AMU tarana, followed by the national anthem. The programme was conducted by Dr. Huma Parveen, assistant professor in Mass Communications.